Things have been super crazy around my house lately but I thought I would get out a really quick card for a friend who has a birthday coming up. Please make sure to head over to my YouTube channel as well by clicking on the video below to see how I colored this card. As I said, it's been really crazy and I didn't even realize I had made a few little mistakes on this card until I was editing the video! Oh well, I fixed them later but the picture was done, the video was done and I didn't have the time to re-do them. Sometimes you just gotta roll with the punches. This adorable image is from All Dressed UP and she was so so fun to color. Other Items used: Spellbinder die for frame, Metallic Jelly Roll pen for drink, Prisma Color Pencils to make final detail and finishing touches. The "Celebrate" sentiment is a digital image from Desert Diva. I printed the image out on Neenah 80# Solar White yardstick and then when I finished coloring her I decided to use the sentiment which is also a digital image. I took a risk by putting my colored project through the printer but luck was on my side today! I cut out the frame with a Spellbinder die to use as a background for the image. I usually like to keep things simple so I thought it was enough. Thank you for stopping by my blog and YouTube Channel. Hello! It's been a very busy, crazy week. It has actually taken me days to try and get this blog post done. The weather has been fantastic! I think we may have finally turned the corner and can maaaaybeee tell Winter goodbye. Sounds like there's a chance for some snow AGAIN this weekend but it shouldn't stick so no worries. I'm not going to let a few snow flakes get me down. Look at this cutie! I really love this image from My Besties. This digital image is called Chloe and Escargot. It's the perfect card for my mom for Mother's Day. She is quite a gardener and I think this image fits her perfectly. I colored this image with my Copic markers listed below and then finished up the fine details with my Prismacolor Pencils. To check out all the details and find out how to create this sky background you can click on the video link for all the scoop. Thanks for visiting my Blog today. I really appreciate your comments and would love for you to visit my Youtube channel as well. My Grandson Max is getting ready to turn 3! I created this card just for him! I ran across this cute image while I was at the All Dressed Up shop. As soon as I saw it, I knew I needed to make Max a birthday card with this. This card has a couple of moving parts which I think will make it extra special to a 3 year old. Click on the image above to watch the video of how I put it all together. As mentioned before, this is a digital image from All Dressed Up. 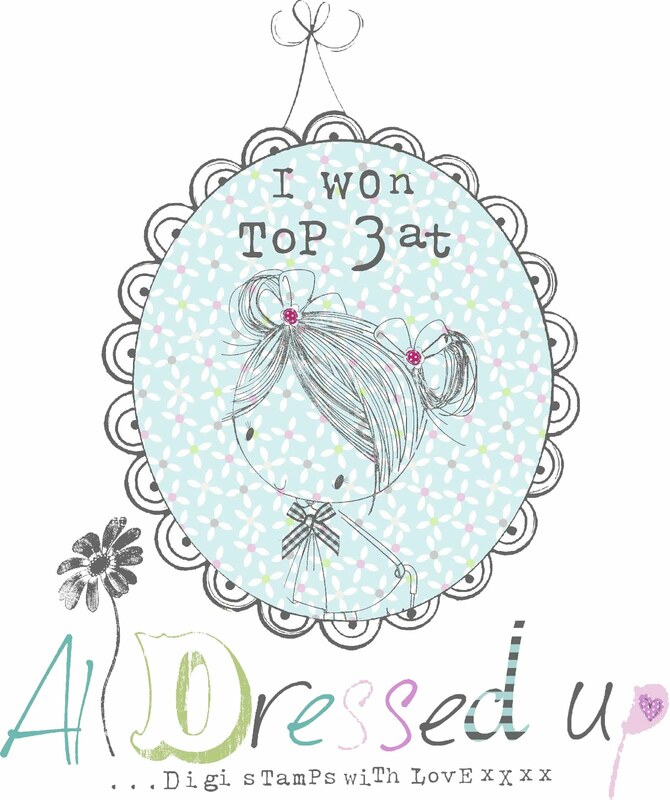 I will be entering this card into the ALL DRESSED UP CHALLENGE BLOG. The image is called A Present for Daddy. I believe it may have been intended either for a Dad's Birthday card or probably for Fathers Day. The original image has words included but for the purpose of this card, since I was cutting it out I cropped most of those letters out before printing. The image was first colored and then I fussy cut around the edges to cut it out. After I cut out the image I used a Copic marker to go along the fresh cut edge and color in any white edges that were showing. I also used an Exacto Knife to cut out between the treads of the backhoe and then colored in the cab of the tractor with a T1 Copic Marker. I was afraid to try and cut around all the details inside the cab. If you watch the video above you can see the details, but I de-constructed a couple of the parts of the backhoe and then inserted some yellow brads to create two moving shovels. I had a stamp with a gift on it so I decided to stamp a couple of gifts over to the side to appear as though the gift in the shovel is being lifted from a pile of gifts. Doesn't every 3 year old want a PILE to choose from?!! If you don't have a stamp with a gift on it, you can easily free-hand a box and draw a bow at the top. Just make sure you draw this in with a Copic friendly ink so the ink doesn't bleed when you go to color the presents. 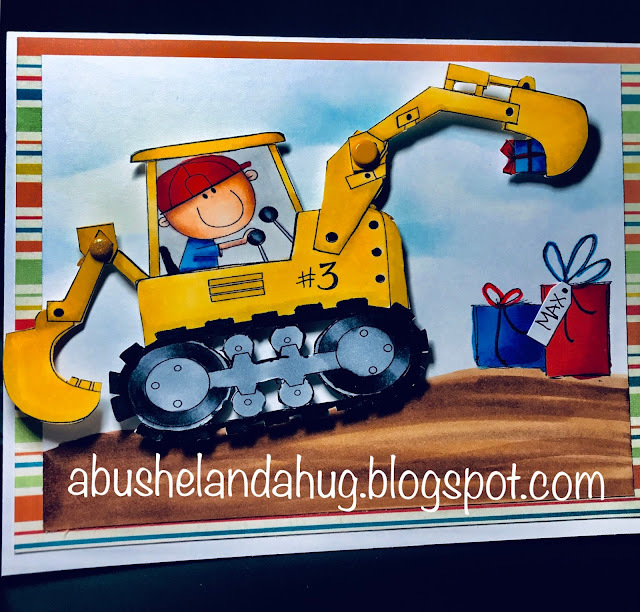 I colored the bows on the gifts with some Glaze pens and then just free handed some dirt at the bottom of the card to give the tractor something to sit on. The sky was chalked in using a homemade stencil. You can watch the video above for that technique as well. The technique is super easy and my all time favorite way to create a sky background. A wrote a little #3 on the backhoe since this is a 3rd Birthday and then I cut out a little tag by hand. I wrote Max's name on it and placed it one of of the gifts. I think this card turned out super cute. I hope he loves it and I hope you enjoyed it as well. 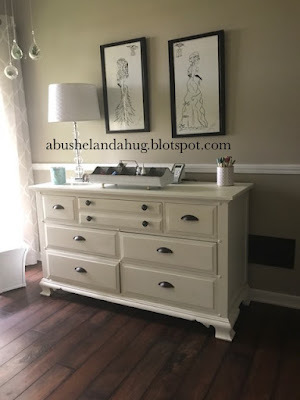 All Dressed Up Challenge Blog and I couldn't wait to share my great news. Wow! I am completely honored because there are some amazing and talented people over there. I was SO excited in fact, that I decided I would just do a short post to say THANK YOU to the gang at All Dressed Up for choosing my card. I plan to enter many more of their challenges in the future because there are so many of those cute images I still want to color. If you are looking for inspiration go check out some the cards and images over there. Also, If you haven't already, please go watch my video on my YouTube channel HERE. Make sure to click SUBSCRIBE because I will be posting more of my cards. I plan to start on one this weekend as a matter of fact (if things work out ). We've got a few ball games to get to but it is my goal to get a card done and hopefully a video as well........Wish me luck. Today I'm sharing a card I made for a co-worker who is going through a tough time right now. 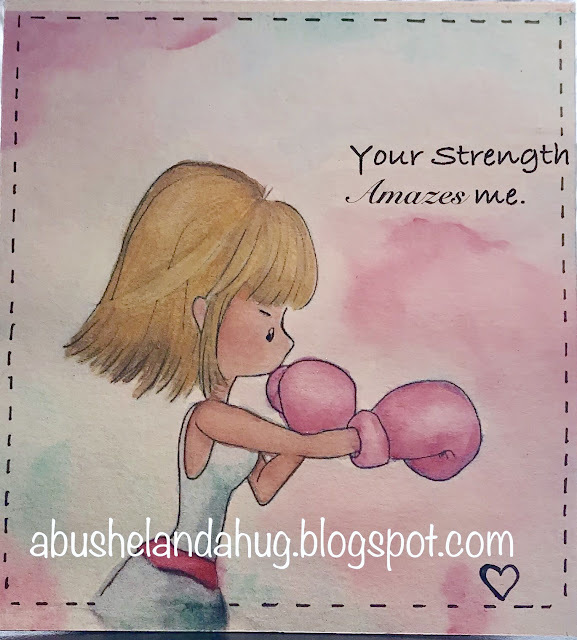 This is a digital stamp from Tiddly Inks called Fight Like a Girl. I knew I wanted to use water colors but since this was a digital image, I didn't really have a way to stamp it with a water proof ink and I wasn't sure if I would be able to water color over printer ink. But it worked! There were some areas that you could see a faint blue or grey when I applied water to the image, but it was so faint that you can't tell once the color is added. The hair looked a little "smudgy" to me though, so I just darkened it up to disguise it. If I didn't tell you here, you would never know by looking at the finished card. I'll have to try this a few more times to see if I get the same great results but I would consider this first test as a PASS on the water color test for digital images. This may vary depending on your printer and the kind of ink it uses as well. I used Canson XL Watercolor paper. I trimmed it down slightly so it would fit in my printer as the pages in the paper pack are 9 x 12 and don't fit in my printer. The watercolor paper is very thick but it went through my Canon printer with no issues. Once the image was printed, I heat set it with my heat tool and then let the coloring begin. I used my Koi water color set to apply color to the image. I didn't have a stamp for the sentiment so I just used a text box and made up my own sentiment by printing it out on the card at the same time I printed the image. After painting the image, I applied a pretty good layer of water on the background before applying the color. This helps the color to move around the page. After painted and dried, I added some details with my Prisma Color pencils, because I just like to fuss with it! I also added some Wink of Stella to the gloves. I just have to add it to almost every card I make. I love the hint of sparkle it gives without being over the top. 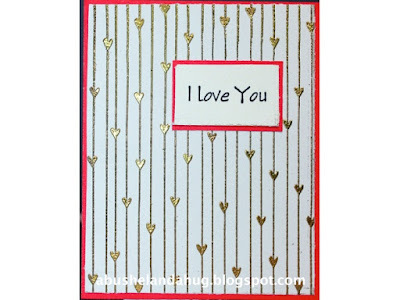 I used my T ruler to add a dotted line around the edge of the card and finished it off by hand drawing a tiny little heart in the bottom corner. As you'll see in the video, I had a few struggles but I feel like I learned from my mistakes. Isn't that what it's all about?! First, I believe I should have used a larger brush. 2nd issue (it's a personal struggle) as mentioned above, I fuss. I'm a fusser. It's what I do! I just can't stop messing with things LOL! In some cases it's ok but when working with watercolor, I think it's really important to be patient because the color changes and softens as it dries. I'll have to practice my patience with this in the future before I add layers to something that may be just fine to begin with. In the video, you'll also see some alterations I had to make to my original card plan but that's part of crafting and being creative. To me, it's the BEST part. Some of my favorite idea's have come out of a "mistake" or a plan that didn't work out. Water color isn't something I've had a lot of practice with but some artists like Kristina Werner inspire me to try it from time to time. I hope this video inspires you as well to get out some paint or markers or whatever you like to do and be creative! Thank you for stopping by my blog. If you like what you see, subscribe above- you'll receive an email when I post something new. You can also subscribe to my YouTube channel as well. 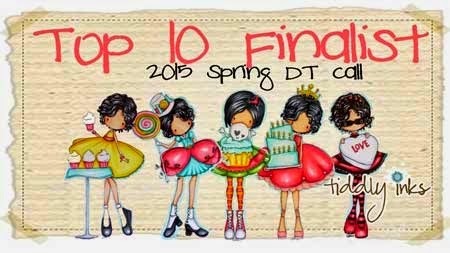 Look at this little cutie I found over on the All Dressed Up Challenge Blog. I'll be entering this card in the All Dressed Up Monthly Challenge. You can find information about that challenge HERE and there's still time if you would like to enter. 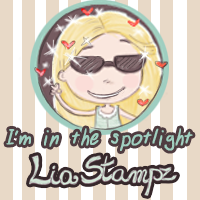 This cute little image was one of several freebies that you can use to enter the challenge. However, you will want to make sure and check out all of the wonderful images at All Dressed Up because they are all so adorable. In making this card, I printed this image at the bottom half of my page knowing that I would be folding it in half to make a top folding card. I chose to make the image just slightly taller than the fold so that part of the balloon shows on the backside of the card, as shown below. You can watch me color this in my video below. As I explained in my last blog, I like to use a piece of paper as inspiration for my colors. 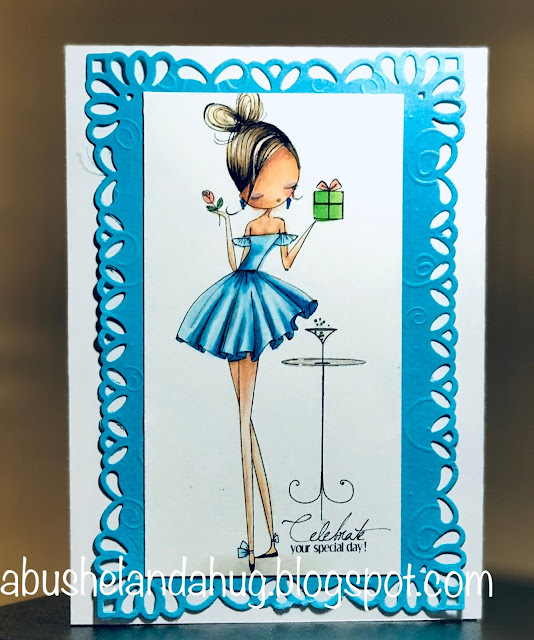 In this case I found a piece of purple paper that I liked and although it wasn't really patterned, I used it as my inspiration for the color in her dress and then later used it to line the inside of the card. When putting the purple paper on the inside of the card it was too long but instead of trimming it off, I thought it would add another element of interest to just fold the paper back onto the backside of the card. Once I determined the sentiment for the card, I knew I had to have confetti. I used some tiny pieces found in the bottom of a package I had purchased quite a while back and then trimmed some pieces of the confetti into slightly larger shapes so the pieces of would be more random and not all appear to be the same thing or same size. This coloring was a bit of a hot mess but in the end my card turned out pretty cute, which only proves my theory that you should keep working on a project even if you make a mistake. Just keep working with it. In the end you may be surprised how well it turns out and if you still don't like it, consider it as good practice. Also, I find that I am able to fix a lot of things with colored pencils after I am done with my Copic Markers. I can add finer details and clean up area's that need it. Thanks for visiting my blog today and watching my video. Have a great day! 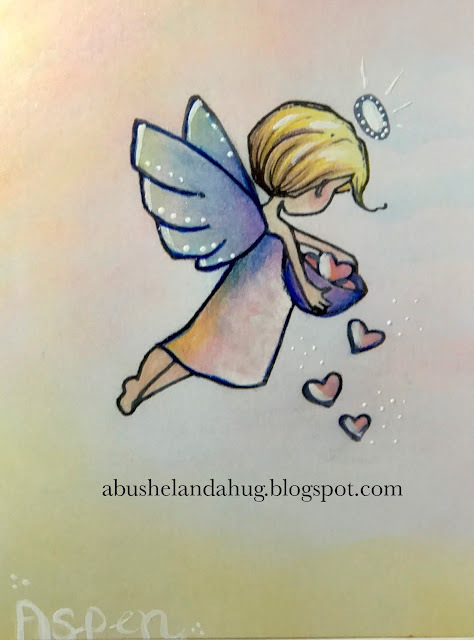 Today I'm sharing a card I made for my sweet mom for her birthday. This is a digital stamp from Tiddly Inks called Sweet Tooth-Let us Eat Cake. I fell in love with this stamp when I saw how some people were coloring in her skirt with many many pleats. My card above would NOT be a good example of this ha ha. I just haven't gotten the hang of it yet. To be honest I haven't put in the practice and I don't know about you but I really have to practice. I will keep trying to fit in some time here and there to get the technique down. A great example of what I'm talking about CAN be found on the Tiddly Inks site HERE. My favorite and most used method of choosing a color group when starting to color an image, is to find a piece of patterned scrap paper in my stash and try to match the colors in that paper to the Copic markers that will be used. It doesn't really matter if you're going to use that paper as a background for your image or not. Generally I do, but either way, it's just a quick way to get a color scheme selected. I'm a little lazy when it comes to picking out the colors, I'll admit it, ESPECIALLY if I'm in a hurry. I mean, sure, if I'm feeling creative and just have time to sit down and have fun and color or craft, I wouldn't do this but generally I don't have that luxury and using this method helps me speed the process along. Another tip - I try to stick to the same colors for the whole image. For example, if I am using G25 and G20 for the clothes in an image, I would try to use those same greens in the tree or in the grass, and if I used a set of browns for the hair, I would use those same browns in the trunk of a tree or in whatever else in the image would be colored brown. This keeps the number of markers down that are being used, it reduces the time you spend trying to figure which colors to use for each individual item and I really feel like it makes the image more balanced. Once I've colored my image with my Copic markers, I always use other items to add little details. These LITTLE details can make such a BIG difference. 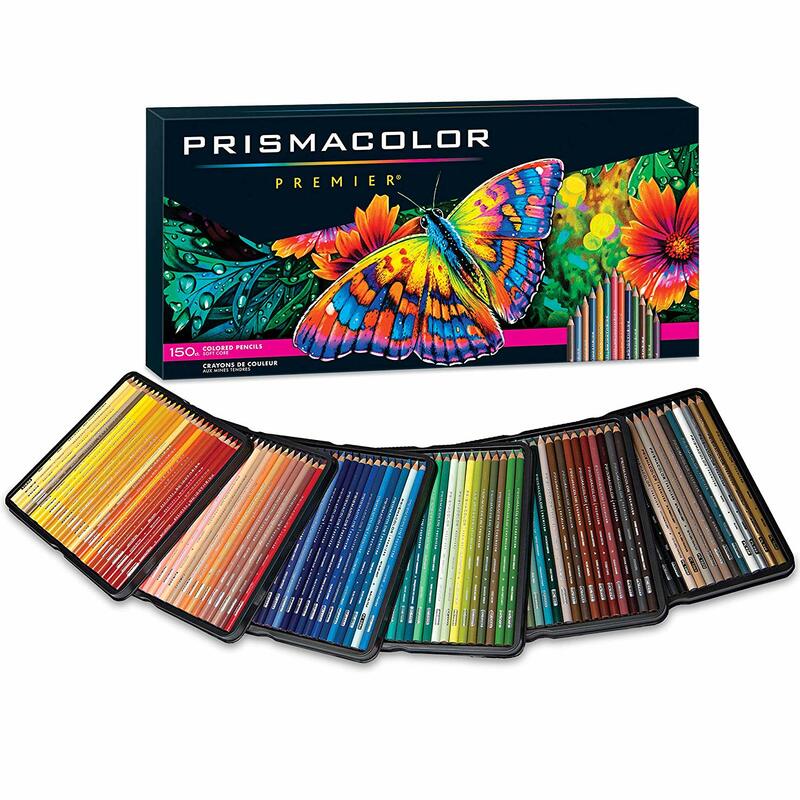 Items such as colored pencils, gel pens, white pens, Wink of Stella etc. After I colored this image I went over some of the areas with my colored pencils to highlight some areas and deepen the color in the shadows. I added white dots to the bodice of the dress and a gel pen to add sparkle to the crown. Clear Wink of Stella was added to give sparkle to skirt. You can't really see some of these things in this picture but in real life it really makes a difference. Well I guess I've rambled on long enough today. I hope you have a wonderful day and fit in a little time to be creative. If you have a process you use when choosing colors for an image I would love to hear what works for you. I hope you have a great day. I know those of us in the KC area are faced with a cold and icy drive to work so be safe out there. Happy Monday to all my crafty friends out there. Jerri here with a card for Tiddly Inks. Although it is coooold and blustery outside, I still feel cheery... perhaps it's because I have the day off or just maybe it's because I've colored this little Tiddly Inks cutie!! 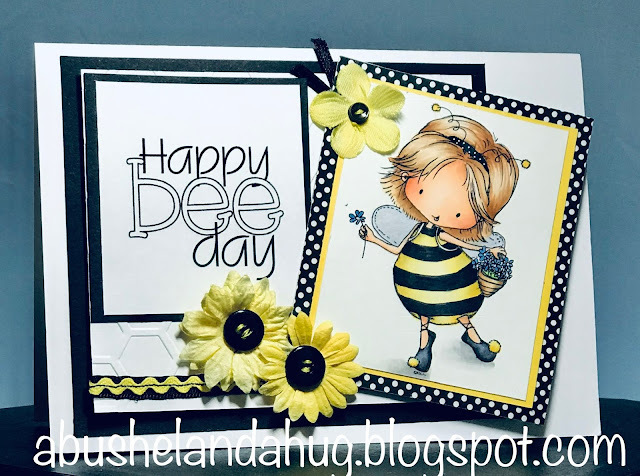 This sweet stamp is called "Happy Bee Day". I will be entering this card for an opportunity to be on the Tiddly Inks Design Team. Wish me luck! I will put a link below in case you would like to enter as well! But first, let's talk about this sweet image. You can find it by clicking HERE. 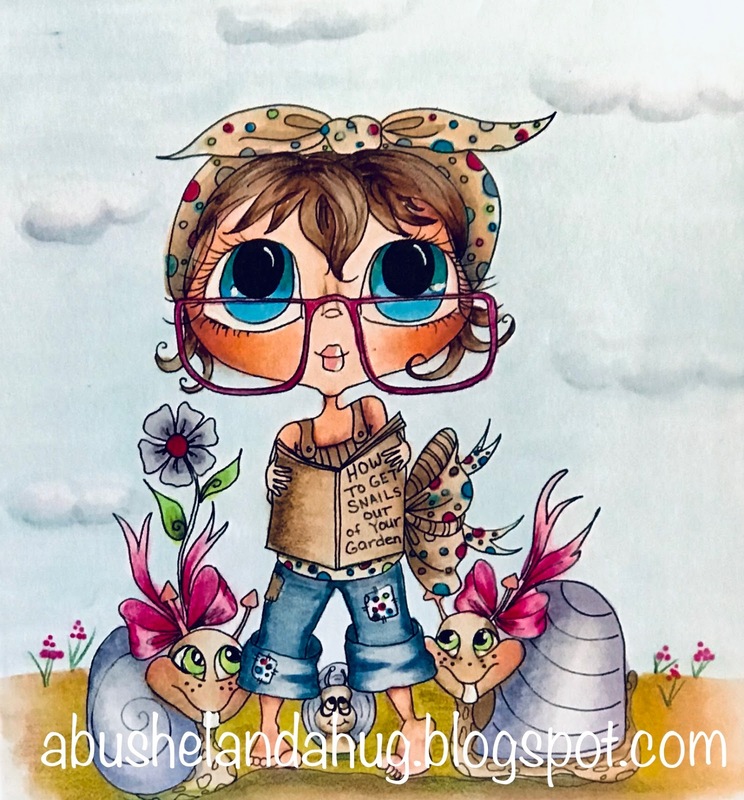 I would highly recommend that you hop on over to the Tiddly Inks Shop where you will find a huge variety of clear stamps, digital stamps, digital papers and coloring books. Wink of Stella was used on her little wings to give them some sparkle. I found the black and white polka dot paper in my stash and used it along with the yellow to matt the image. A white gel pen was used to put dots on her head band. 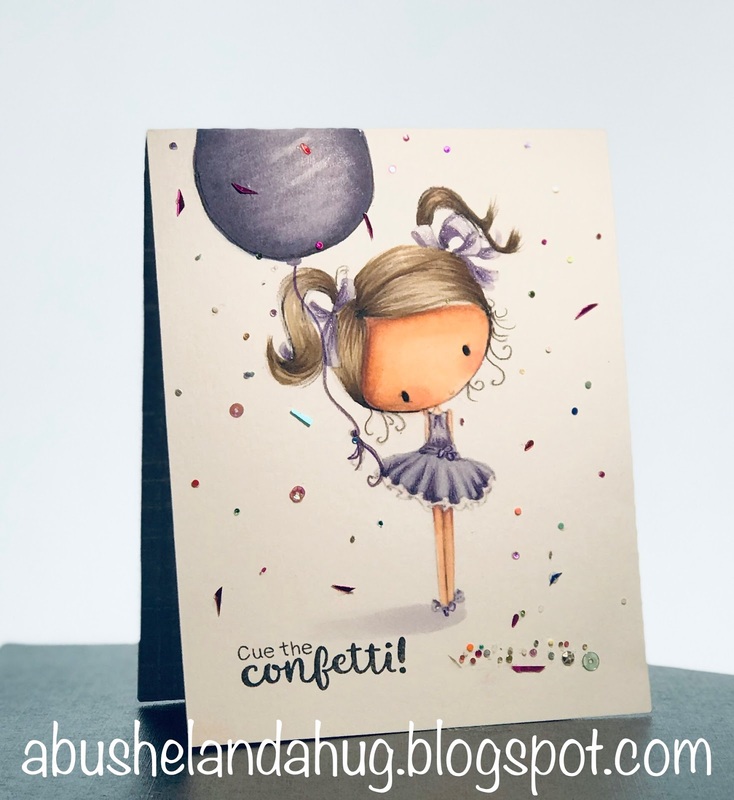 For finishing touches on the card itself, a Cuttlebug embossing folder called "Honeycomb" was used for the white background. I stitched together a black ribbon and a little piece of yellow ric rac to run along the bottom of the card and the flowers were colored yellow using my Y13 Copic Marker and finally black buttons with yellow thread were used to make the centers of my flowers. This was So Much fun to color!! Just what I needed to cure my Winter blues today. 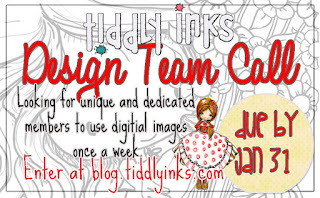 If you have an interest in becoming a Tiddly Inks Design Team member click on the image below. Thank you for stopping by my blog today! Please feel free to leave your comments and questions. I'd love to hear from you. Look at this sweet image from My Besties. There are so many cute images at this site. I really have a hard time deciding which one I want to use. I thought I would work on a few Valentine cards because you know it will be here before we know it. I colored this image with my Prisma Color Pencils. I used some Glossy Accents on the lenses of her glasses and then found a little " I Love You " stamp buy a company called Stamp and Cut. I think I purchased the stamp from Hobby Lobby. I matted the image on some patterned paper and lined the inside of my envelope with the same paper so they match. Well today I get back to work after a nice long winter break. I work for a school district so I am so blessed to have a couple of weeks off during the holiday but today that ends and I will be heading back to work. Below is a card that I have created for two purposes. First, it's perfect for my Niece's upcoming birthday. 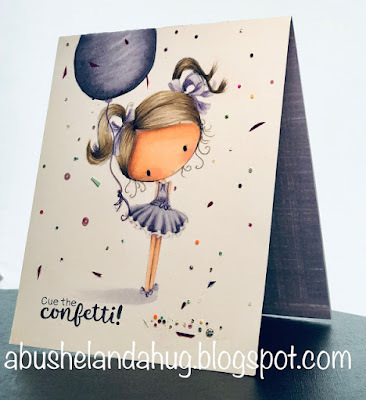 Second, I will be entering this card into the Challenge on the All Dressed Up Blog. Make sure you use the link I have provided above to check out all of the fabulous images in her store. Also check out the wonderful creations entered into the challenge. The image I've used below is called Sweetie Pie. Skin: E00, E01, E11 and R20 for the cheeks and lips. Hair: E31, E33, E50. Dress: BG13, BG11, BG10. I added some highlights with my Prisma Color Pencils and matted the image and glued it to some background paper was in my stash. It's Not Just the YEAR That's New Around Here! Happy New Year! A lot changed for me last year. I changed jobs, moved to a new house and got a different vehicle! It was a great year and I am grateful for all of the blessings in my life. I am working a few less hours now and thought it would be a great time to get back to my blog. I've been working hard setting up my craft room in my new house. WOW! If my husband didn't realize how much crafting stuff I have BEFORE we moved, he sure knows AFTER. We loaded box after box after box up the steps into my new space. I cannot wait to get it together. I'm sure I'll share pictures when I do. Having a new, bigger craft area is motivating me to spend more time crafting again and I hope to make more cards, crafts, and participate in more challenges this year. The weather has been beautiful in KC. 60 degree weather is a little crazy for January but in Missouri you just never know! 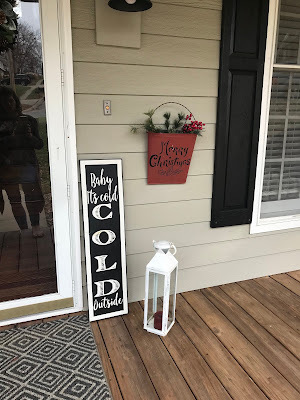 The warm days have given us a great opportunity to take down the Christmas decorations from the front porch. I took a few pictures of what our porch looked like this year. 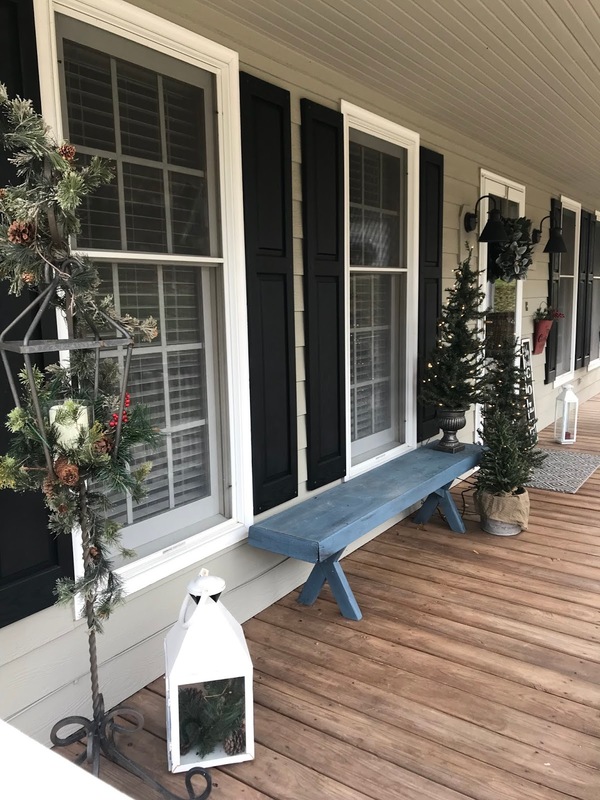 We put up new shutters on the house when we moved in and stained the floor of the porch. I love it. I refused to spend the big money that retailers wanted for a wreath. I bought a few stems from Walmart and tucked them into a wreath I already had. 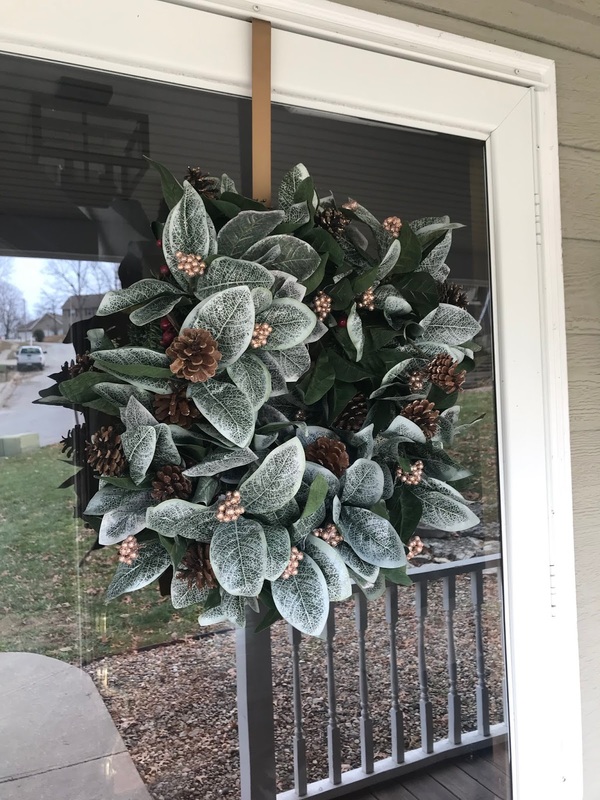 This wreath literally cost me about $7.00. Thanks for reading my post today. I'll be back tomorrow with a card. Happy Friday! Another busy weekend ahead for me but luckily I've had time to create a couple of cards for the Tiddly Inks 2:3 Challenge. You can get the scoop over at their blog. Click HERE for more information. Purple Sleeves and Trim on Hat: R29, V09 (I started with Red and changed my mind). Once the image was colored, I fussy cut her out to place on the background. I used craft foam underneath the image to pop her up above the background. The background was created on watercolor paper. I just drew a rough sketch of witches cauldron and then colored it in using my watercolors. I used a circle punch of paper as a guide to draw a moon and then colored it in along with the sky and clouds using watercolors for this as well. I added highlights to the clouds using my white gel pen. The bubbles in the cauldron are just drops of Glossy Accents that I used to give it dimension. I loved the way this little lady turned out. I'll be entering this card into the "Anything Goes" portion of the challenge. This cutie here is another fun witch to color. This image is called Too Cute to Spook. She's a little sweetheart so I'm entering this card into the Girly Girl portion of the challenge. I chose to do her dress in a more purple hue instead of the warmer grey tones I used in the first card. I think purple is a little more appropriate for a Girly Girl ha ha. I inked the background of this image with distress inks and a blending tool. I used Tim Holtz Distress inks in Black Soot and Seedless Preserves. I went over the dress with Wink of Stella to make it shimmer and shine. Thank you for visiting my blog today. I'll see you soon with some more Halloween cards! I hope you've been inspired to do something crafty, or perhaps to even enter the challenge above. 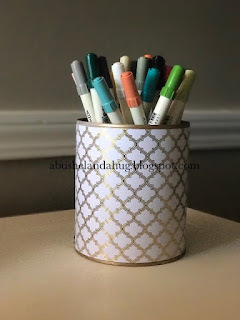 Even if you don't want to enter the challenge get on over to the Tiddly Inks Blog and check out all of the entries for tons of crafty inspiration. I'm feeling a little like a super hero. This weekend has been a crazy whirlwind. I went out of town for a business trip, I went to a high school football game, two volleyball games, a music show and a birthday party! Somehow I found time to pull together a little tag for my granddaughters birthday gift. This wasn't my best work and in hindsight, I would have done a few things differently but hey, I will chalk it up as a learning experience. I usually need to practice coloring an image a couple of times before I'm happy but with everything else going on this weekend, doing ANYTHING twice wasn't an option this weekend. To be honest, I was going to do a card but I messed up on the background and ended up cutting out the image. Then I decided I would put this sweet image on a tag. After I got everything glued down, I noticed I hadn't cut the area out between her legs. OOPS! Too late! I have been wanting to do some video's and so I gave it a shot while coloring this image. Lets just say the video was a learning experience as well. Perhaps with time I can improve on the process. You can click on the video below to watch it. 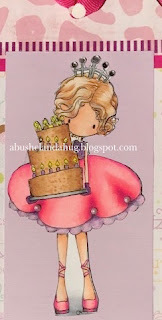 The image used is a digital stamp from TiddlyInks, called Let Us Eat Cake. I love her images. I purchased a few of her Halloween images just few days ago. 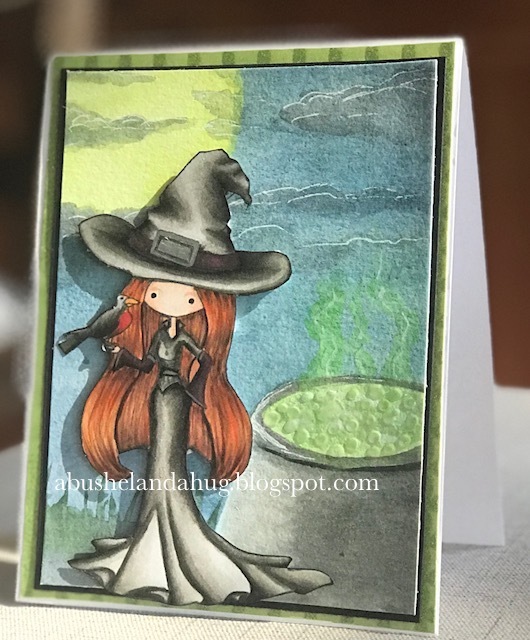 I'll be trying to feature a few of my Halloween cards on the blog soon. I wrapped a gift for my daughter-in-law today in a beautiful paper that had pink flowers and some gold embossing on it. I was immediately inspired to make a card with those same elements. I knew I wouldn't be able to make a card that "matched" her wrapping paper exactly but by using the same elements it gives the impression that it matches. I pulled out a stamp set that I've had for a very long time (sorry the packaging is gone and I'm not sure who made this one). These are individual stamps that I used randomly all over the page. A background stamp would be great for this technique as well. 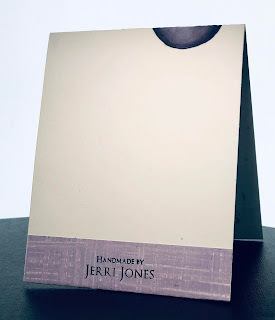 Cut a piece of watercolor paper to the size card you are going to make. I used 5 1/2 x 4 1/4. Use an Anti Static powder on the paper generously. 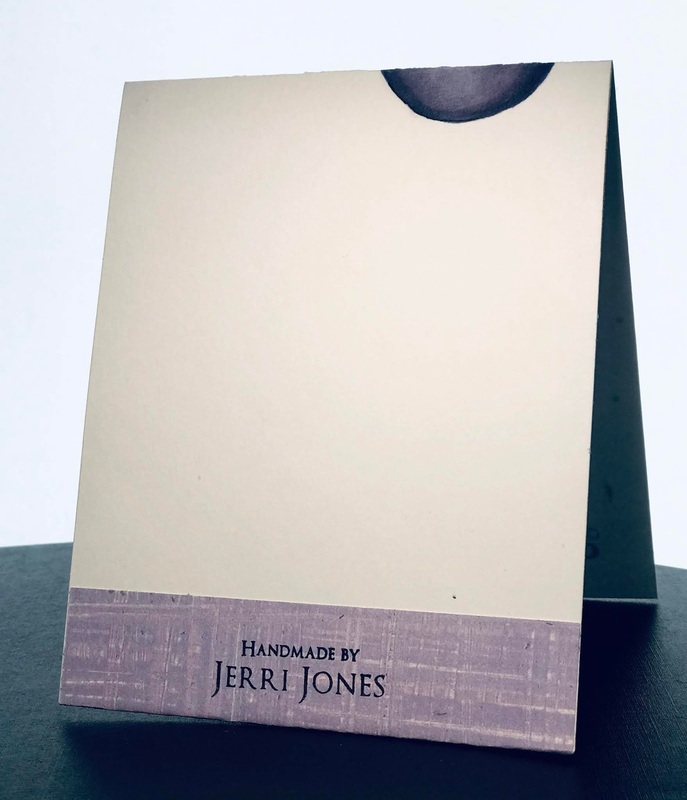 Stamp your design on the card with Versamark Ink. Sprinkle Gold Embossing power over your stamped area. Shake off excess embossing powder. Heat card front until the powder has melted. Use a large paintbrush and wet the entire card front with water. Using your Distress ink and a brush, apply the ink to the card in random areas until you get the saturation and look that you like. I used Tim Holtz distress inks in Vintage Photo and Picked Raspberry, but you could use any color of distress inks or watercolors. I trimmed my watercolor piece down just a tad on the top and side so that it would fit on an A2 card made from regular white cardstock. I cut out a small flag by hand and stamped the birthday message on it and embossed it as well. I put foam tape behind the message to apply it to the card giving the message dimension. I was pretty happy with the way the card turned out. I love it when a plan comes together! I hope this card inspires you to try something new. 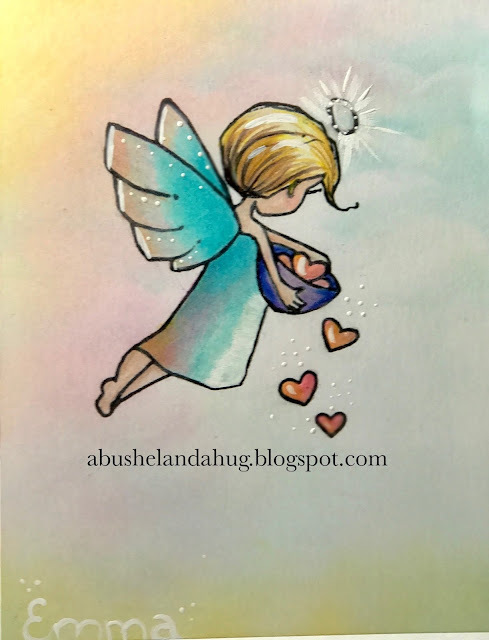 Well what do you know, I found one more old file with Valentine cards I had made back in February for my granddaughters. This should be the last old picture I pull out of my....... I think. Isn't is crazy what you find when you work on organizing?! I talked on my last blog post about backgrounds. This is another example that. 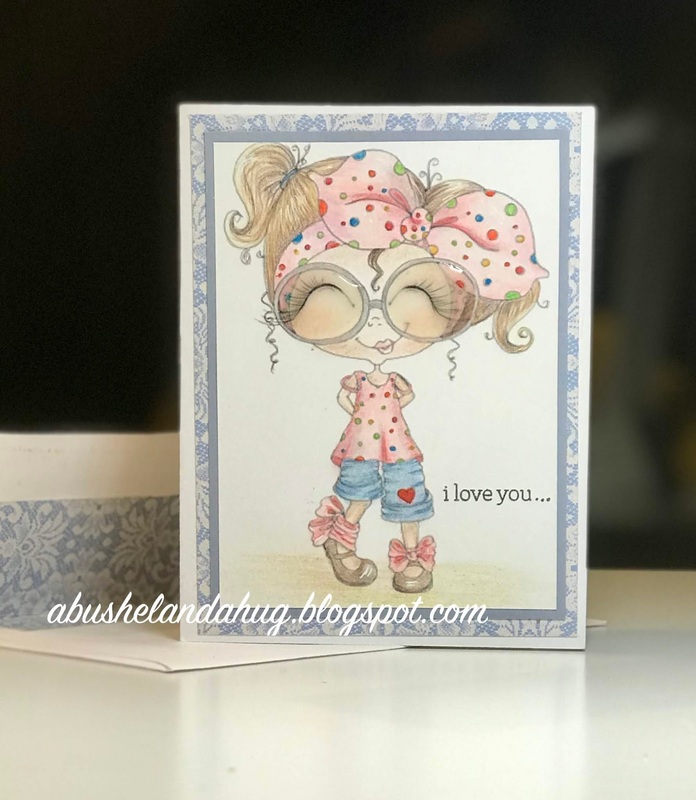 I stamped these on watercolor paper and then used my distress inks with water to create these cards. I created highlights with my white pen but if I remember correctly the white highlight area on her dress was done with my white Prismacolor pencil. Today I was clearing through some things and getting some of my pictures in order. I came across a card I had made back in March for my sons birthday. I wasn't really posting on my blog at the time and I had forgotten about it. When I was making this card I was really trying to work on background techniques. This cute guy is a digital stamp from Sassy Cheryl's. I LOVE her images. 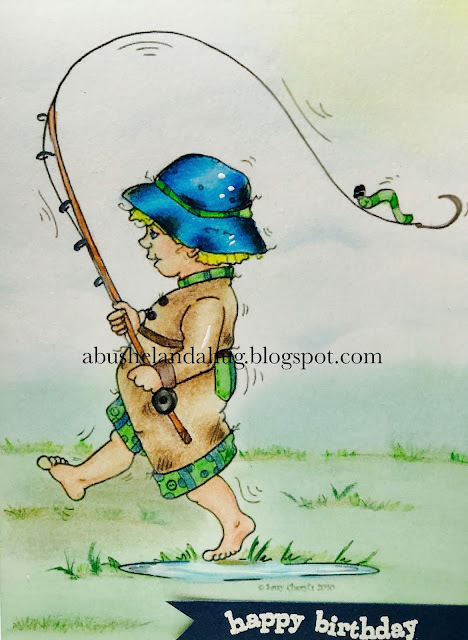 This is a really old image and I don't believe it's even available any more however if you are looking for a "fishing style" image she has many new one's to choose from. Because I found this card in the archives I don't have the Copic colors used to create it. 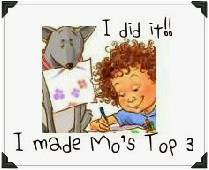 I can tell you that the boy was colored with copies and the background was done with chalks and colored pencils. The little puddle was done with Copic and then I used my white gel pen to highlight it and then a little Glossy Accents on it to make it look wet. I really like creating backgrounds on the card that the image is printed on. I've been trying to build up my courage to do it more often. I'm always afraid I am going to work forever coloring my image and then mess it up when I try to do the background. And sometimes I do! Sandy Allnock is a pro at creating backgrounds on her cards. She has a great Youtube channel and blog with lots of information. She has inspired me to try backgrounds more often. I've been practicing!! 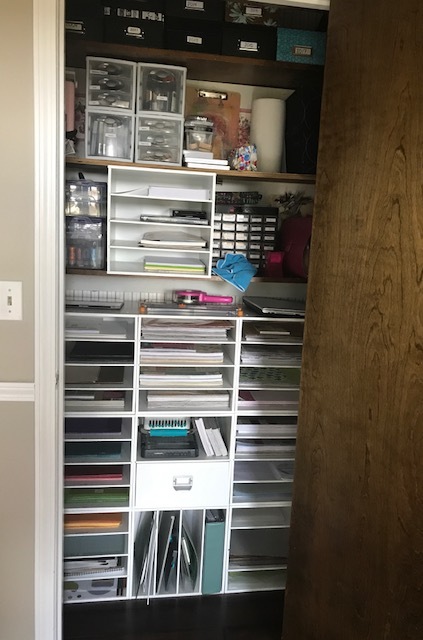 I recently decided to move my craft room to a different room in my house. This turned out to be quite a job. I live in an earth contact, so two of the 4 bedrooms in our house are in the back part and have no windows. My craft room used to be in one of those rooms. It was a larger room room but lacked natural light. 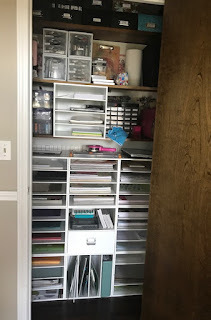 You can see pictures of my old craft room space here. I decided I wanted to turn the larger room (without windows) into a TV/play room for the grandkids, and move my craft room into the smaller room so I would have windows. I do miss having more work area but haven't regretted the change because I LOVE the natural light. It's been a challenge trying to find a way to get all my stuff in the smaller room. After months of trying, I think I have come up with a solution that will be a winner. I bought an old dresser off of a local "swap and shop". I painted it with chalk paint and gave it some updated hardware. Being almost 50 years old, its built with solid wood. As a bonus, two of the drawers have dividers, which is so nice for what I'm using it for. I think it turned out great. I am really happy with the outcome. I though I would share some of the other areas in my room, since it's clean for the moment! This is my desk where I do most of my marker work. First I want to talk about the wine racks you see hanging on the wall. I put all of my Copic markers in these and I love the way it looks and functions. I saw the idea on Pinterest. The pinner said she got her wine racks at Target but I couldn't find them there so I got these on Amazon. I think I would like them to be hung closer together but after moving things around several times, my husband was OVER IT, if you know what I mean lol. I also updated my chair. I used to have a stool but I got this chair for a steal at TJ Maxx. It's comfortable, has the ability to roll, and I like the way it looks. We moved the light from my old craft room into this new room. The craft shelf was also moved. Most of the storage containers on the shelf are made from repurposed items. The pencils at the top of this shelf are in a container that a candle came in. I am getting two more of these to make a matching set. When it sits on the shelf you don't see the label, but honestly the label doesn't bother me. The glass jars are repurposed candle jars. I know the jars on the bottom were purchased at Walmart. I got them a long time ago so I'm not sure if they still have this style of jar. Once the candle was gone, I just cleaned out the left over wax with very hot water then ran them through the dishwasher. In the picture below I repurposed a Target spice jar, Market Pantry brand. I use these for smaller items like sequins, googly eyes etc. are in a repurposed peanut can. I painted it with gold spray paint and then measured and cut scrapbook paper to wrap around the can. I bought this little galvanized tray at a flea market. I've painted it to match my room. I love the way it looks but quite honestly it doesn't really work. It's too long and takes up too much room on my table. 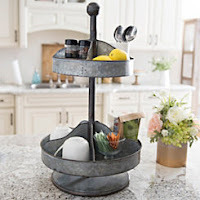 I think at some point, I am going to sell the tray or find a way to hang it on the wall and get something like this tiered stand from Kirklands to sit on my desk. I just want to see how much I really need it since it's $50 and I'm on a budget. Now last I thought I would show you my closet. It's only half as big as the one in my old craft room. Its not pretty but it is organized. Making this "pretty" will be another project for another day. Thanks for letting me show off my latest work I've done here in my craft room. I hope you've gotten some ideas, or inspiration. 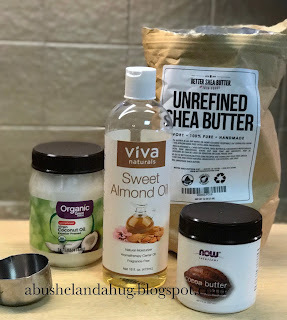 So yesterday I had a little spare time and I needed to make a batch of my favorite body butter so I decided to put together a series of pics and instructions on how I make MY DIY Body Butter. This is MY favorite recipe. There are tons of recipes on the web. You may have to try a few to find the one that you love, or make some tweaks. but I encourage you to keep at it until you find the recipe you love. That's how I actually got this recipe, I started with one I got from a friend and made changes to fit my liking. This is a wonderful moisturizing lotion. 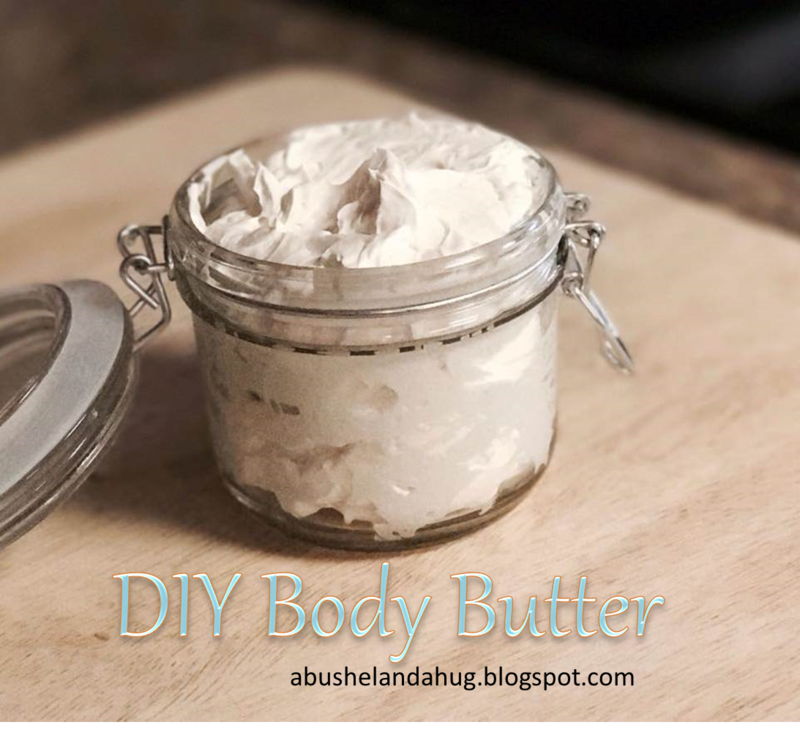 It melts into an oil once it is applied to your body but soaks in rather nicely. I like to use it before bed. I started using this recipe last fall and this is the first winter in a looooong time that I haven't had cracked dry heals. Directions- First I create a double boiler by placing a metal bowl into a pan that has a little bit of water in it. I make sure the water is not touching the bottom of the bowl once it is placed on top. Bring the water to a boil to heat the bowl and place the ingredients above into the bowl (up to the Almond Oil). Remove the pan from the heat and sit it aside to wait for your ingredients to melt slowly. You do not want the temperature to get too hot. It will be just beginning to harden around the edges of the bowl. At this point you will want to add the rest of the ingredients. and mix them together. I use either a hand mixer or a stand mixer. I used a hand mixer for this batch. once the ingredients have been combined place the bowl back into the freezer until the mixture is more solid but not so much that it has become hard. At this point you will want to begin mixing. This is where a stand mixer is nice because the more you mix, the fluffier it will become. mix......... mix................. mix until you get it nice and fluffy. This will take a while. Put it into a container that has a lid. 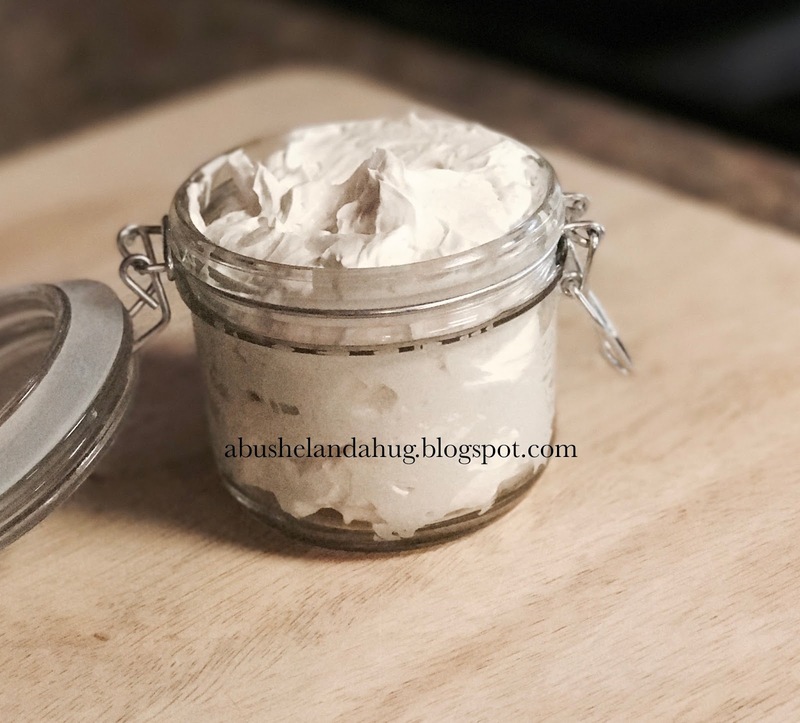 It will be a little soft at first because it is a little warm from all of the mixing but it will stiffen up once it has cooled back down to room temperature. I like to put mine in a small glass container and give them as gifts but you can use anything you may have around the house too. I found this glass container at TJ Maxx for next to nothing. I really hope you enjoy this as much as I do. If you have any questions let me know! 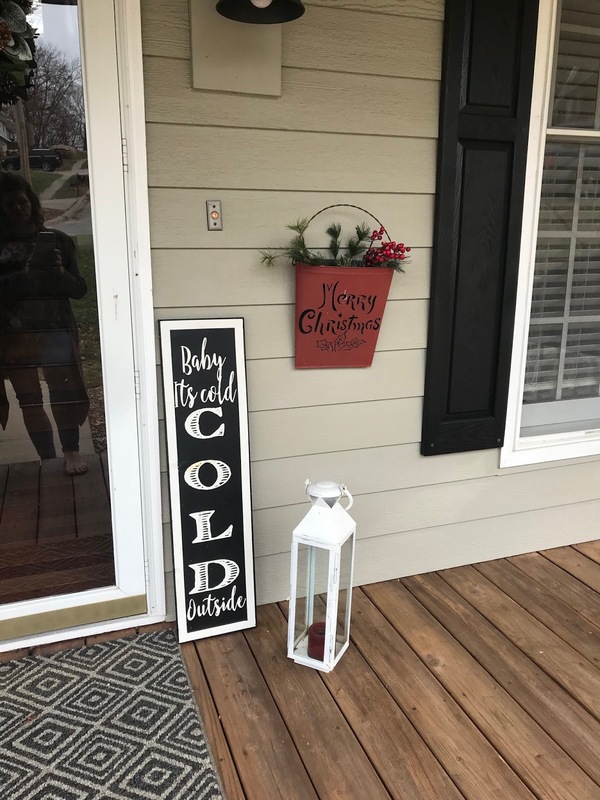 TodayI want to share a Pinterest Success story. Yeah me! 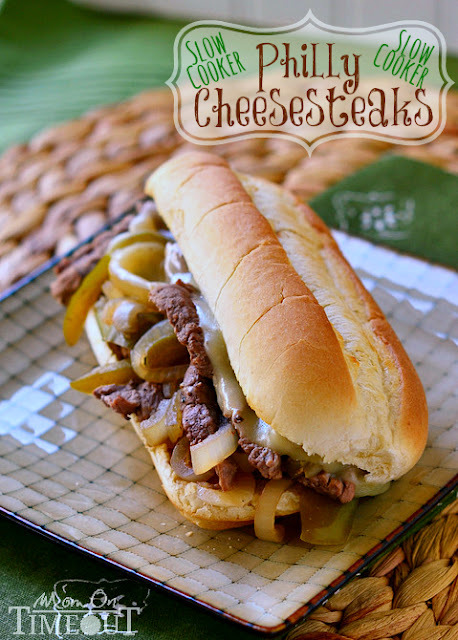 I found a Crock Pot recipe for Philly Cheese Steak that is so delicious and so easy, I just had to write a quick post and share it. Click on this link to find the recipe- Mom on Time Out. My husband couldn't get enough. I mean it was "melt in your mouth" good. We will definitely make this again and again. I found some super thinly sliced round steak to use in this recipe which made it even easier. After cooking in the crock pot, it was so tender and delicious. I strayed from the recipe just a tad ( which is pretty normal for me). First of all, I poured the stock into the crockpot and realized it was chicken stock and not the beef stock that was called for, so I threw in a couple of beef bouillon cubes and hoped for the best. Second, I had forgotten to buy Provolone cheese so I used Monterey Jack. Third, I decided to put some butter on the buns before placing the in the oven. This would be a great week night recipe because it was so fast and easy. I hope you give it a try! Well it has been a long time since I have posted on this blog! I just don't find the time now that I work. I was inside all weekend due to the impending ice storm. I decided to put my time to good use and get some valentines done. I love to craft on rainy days. I'll try to get most of the cards posted that I got done today. I'm being lazy and using my new iPhone to capture these images. I know it's not quite the quality as when I use my camera with the proper lighting and all, but I am rarely here during daylight hours and I don't want to pull out my tent and lights etc. I'm just going to make this work ha ha. The first card I created is a digital image from the blog Fred She Said. This is a pretty old image called Nolan's Monster. The digital image is NOT a valentine. It is just the monster, holding a stick with the leaf on it. I try to think outside the box when I get ready to make a card. I feel like I get more bang for my buck. Here's how I made my card. 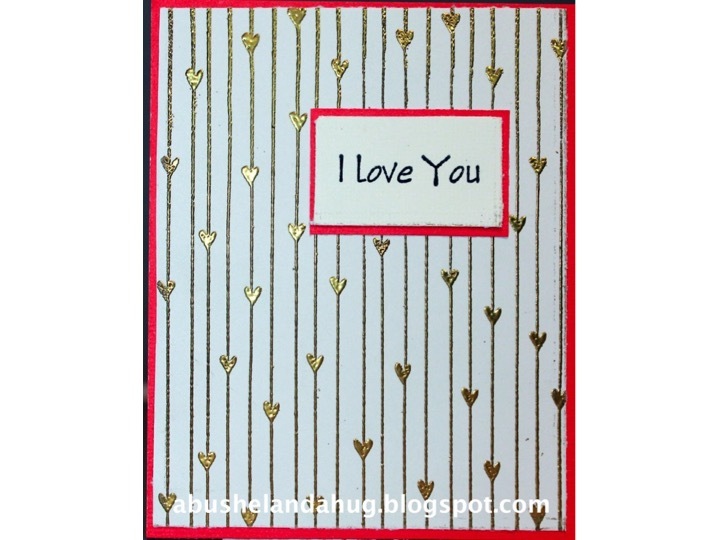 I used an embossing folder to create the heart background. 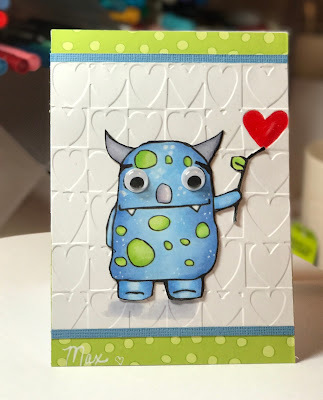 After I colored and cut out the monster, I positioned him on the card so that it looks like his stick is at the bottom of one of the background hearts. I colored in that heart with my R27 Copic marker, I then added a bit of clear Wink of Stella and some Diamond Glaze on top of the heart to give it a shimmer, like a balloon. I added some googly eyes to the monster to make him extra cute. Copic colors used for the monster are: B23, B21, B32, YG05, YG23 & YG25, BV20 & BV23. I used my white Prismacolor pencil to highlight some of the areas and to add some little dots to the monster. I think he turned out pretty cute! It's been a while since I've had to time to color, so I definitely feel out of practice but I hope you enjoyed what you saw here today. Maybe I'll have more time to craft in 2017. I appreciate you visiting my blog. Let me know if you have any questions. I'd love to hear from you. 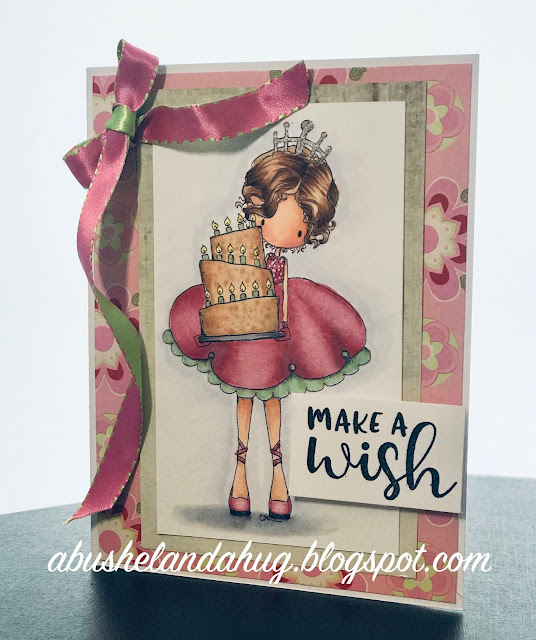 Today I'm sharing a card that I made for the Technique Junkies Design Blog. I know, I know. We don't even have Christmas out of the way and I'm already thinking ahead to Valentines Day. Hey, it pays to think ahead sometimes. This Card was made using Sweetheart Pillow Ticking and I Love You stamp SDX033. This card is pretty straight forward but thinking ahead, though it could be a real cute card for Valentines Day. I stamped the background stamp on white card stock and embossed in gold. I matted it with a coral pink paper. Next I stamped the sentiment in black matted it on the same coral paper as well. The card turned out very pretty. The color didn't quite come through in the photo but of course you could do this in any color you like. Marry Christmas to you and yours! Well Christmas is almost here. I thought I would post one last Christmas card. Today I used the stamp called Ornament from Technique Junkies. I started by using a Cuttlebug folder to emboss the background of the card. Next I stamped and embossed the ornament in white on a piece of purple cardstock. I used a distress tool, to distress around the edges of the purple paper and then matted that on a piece of white cardstock and then again on a piece of silver metallic paper. I used some craft foam to mount the ornament onto the background. Well I hope you have enjoyed my card for the day. Kitchen Aid Stand Mixer Repair and Spotlight Winner! Hi I'm Jerri! 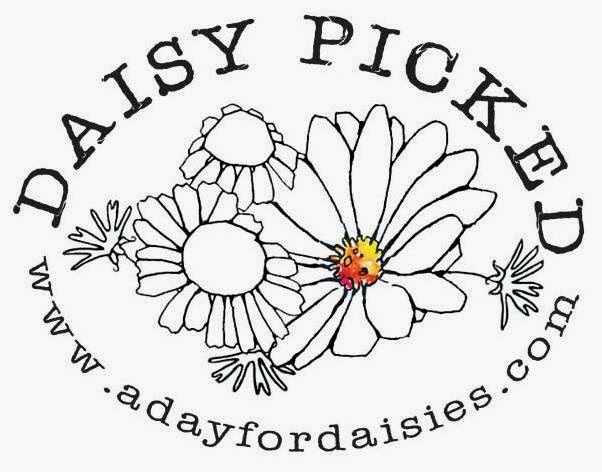 Welcome to my blog for all things crafty. I am a wife, a mother and a grandma. I have a passion for paper crafts but you'll find other crafts and tidbits here too. I hope you find something here that interests you. All opinions on this blog are my own. All information provided on and taken from my blog is done at your own risk. The information on this blog is for entertainment purposes only and should not be viewed as the providing of medical, legal or other professional advice. Unless otherwise noted, I am the legal copyright holder of the material on this blog and others cannot use it to reprint or publish without my written consent. Copies of my designs cannot be sold without my written consent. If I receive a product to review, it is my policy to make note of how it was acquired however, I will only recommend products I genuinely use. I do not accept offers of direct payment for dedicated blog posts to promote products. Your personal or contact information will not be sold to another company and will not be put on spam lists. I cannot be held responsible for the privacy practices of my advertisers or persons commenting on this blog. Any letters, messages, tweets e-mails or other correspondence may be shared.